Cam's Cinematic Episodes: Film Review - KNOWING: Ain't Even Remotely Believin'! 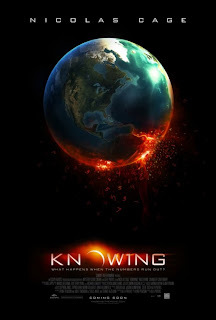 Film Review - KNOWING: Ain't Even Remotely Believin'! Hoo boy, gather ‘round kids, do I have a tale to tell all of you! Okay, this story, called Knowing begins fifty looong years ago in Boston, Massachusetts, during those sleepy, innocent days of 1959. A recently opened elementary school there decided to take suggestions from its cheery students – kids were so much less lippy those days! - for how they should celebrate the inaugural semester. The best idea, posed by Lucinda Embry, the spooky girl at the back of the room, was to make a time capsule for future students to open. Well, everyone thought that idea was the cat’s pyjamas and began drawing adorably far-fetched visions of what the far-off year of 2009 would possibly look like. Except Lucinda. Apparently possessed, Lil’ Lucinda filled her entire sheet of paper with an endless string of numbers. A code, perhaps? Sadly though, the capsule burial ceremony got ugly when Lucinda disappeared, and was later discovered frantic and bloody-fingered, carving numbers into a closet door with her nails. Creepy, huh? Time-warp! Now we’re in the modern day, where Nicolas Cage, playing an alcoholic, grieving astrophysics professor named John Koestler , teaches at a fantastical M.I.T. campus which, among many wonders, boasts almost zero Asian students. Having lost all faith in intelligent design and ordered determinism after the tragic death of his wife, John raises his rascally son Caleb (Chandler Canterbury) in a dilapidated house and coasts his lonely way through life. But – there’s always a “but”! – when Caleb, following the time capsule’s excavation, brings home Lucinda’s sheet of random numbers, John slowly realizes that each of the digit patterns corresponds to a real-life disaster. After surviving a horrendous plane crash, John recruits Lucinda’s daughter Diana, played by 28 Weeks Later’s Rose Byrne, to help him stop the disasters from a-happenin’. And then the aliens show up... Betcha didn’t see that comin’! 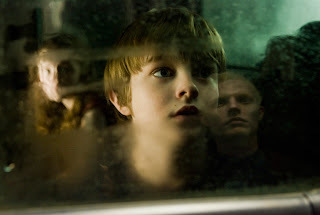 Produced and directed by visionary wunderkind Alex Proyas, who, in the past, bestowed upon us the artist ically dazzling The Crow and Dark City, as well as the semi-successful I, Robot, Knowing aims for the stars, but barely clears the neighbour’s fence. 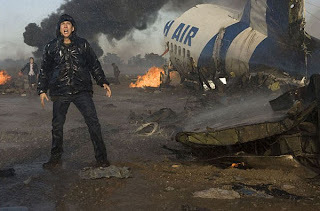 My snarky comment aside, there are a number of great moments in this wonky paranoid thriller, such as the aforementioned airplane catastrophe, a hypnotic combination of CG and live action, which is one of the most arresting action sequences in recent history. Seriously, it’s that good. There’s also a cataclysmic subway crash and an apocalyptic forest fire, filled with frantic burning animals, that plays like dazzling eye-candy for the cynical and hard-to-please. Oh, but sweet Sally Jupiter do you have to suffer to reach those moments. Aside from the films relentlessly dour tone, the plot and aforementioned alien business is truly ch eesy. Looking like a Teutonic industrial metal band (“Nein! Inch Nails”, perhaps? ), they frequently lurk in the background standing statue-still and looking ominous, but feel like tired leftovers from a bazillion horror and suspense films. Not to mention that their grand plan, when broken down, makes very little logical sense. Why involve little Lucinda in the first place? 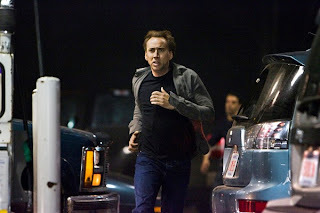 The actors are decent to awful, with Cage turning in good to serviceable, if lacking in inspirationally weird, work. Rose Byrne, on the o ther hand, is tremendously pathetic. Often hysterical, screaming lines such as “WE HAVE TO SAVE THE CHILDREN!! !”, you’ll find yourself quickly rooting for her number to come up in Lil’ Lucinda’s lottery of numerical death. To be fair though, she does earn points for being on the receiving end of Cage’s creepiest romantic come-on since Next’s romantic scene with Jessica Biel. The film looks pretty darn nice, though. And while I wondered why it was always necessary for John and Diana (along with the kids) to investigate every single creepy going-on in the dead of night – not to mention an early scene wh ere the searchers could have just turned the lights on – Proyas films his pitch black night-scenes with a nice ethereal glow which gives it an otherworldly feel. Also, I feel compelled to acknowledge the score by Marco Beltrami, which is fairly subtle and haunting... Until the latter half of the picture, that is, when he doesn’t so much rip off Bernard Hermann’s Psycho theme, as haul the dearly deceased composer from the grave, attach strings to his extremities, and put on an unholy puppet show of creatively bankrupt mimicry. *Originally Printed in SFU's The Peak: March 30th, 2009.